Chicano-Indian American Cultural Center The University of Iowa 308 Melrose Avenue Iowa City, Iowa 52242 319/353-4753/6014 TO: Arnulfo Ramirez Resident Manager, CIACC FROM: A. 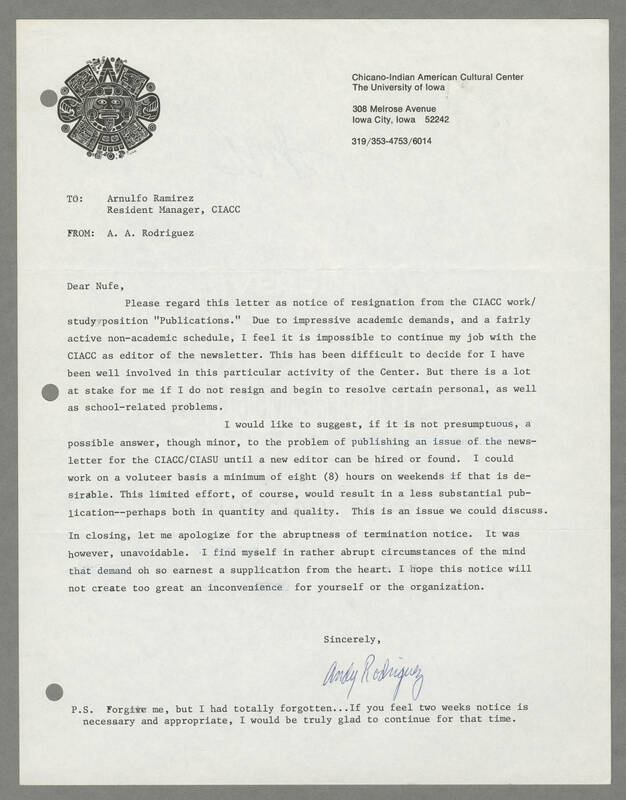 A. Rodriguez Dear Nufe, Please regard this letter as notice of resignation from the CIACC work.study position "Publications." Due to impressive academic demands, and a fairly active non-academic schedule, I fell it is impossible to continue my job with the CIACC as editor of the newsletter. This has been difficult to decide for I have been well involved in these particular activity of the Center. But there is a lot at stake for me if I do not resign and begin to resolve certain personal, as well as school-related problems. I would like to suggest, if it is not presumptuous, a possible answer, though minor, to the problem of publishing an issue of the newsletter for the CIACC/CIASU until a new editor can be hired or found. I could work on a volunteer basis a minimum of (8) hours on weekends if that is desirable. This limited effort, of course, would result in a less substantial publication-- perhaps both in quantity and quality. This is an issue we could discuss. In closing, let me apologize for the abruptness of termination notice. It was however, unavoidable. I find myself in rather abrupt circumstances of the mind that demand oh so earnest a supplication from the heart. I hope this notice will not create too great an inconvenience for yourself or the organization. Sincerely, Andy Rodriguez P.S. Forgive me, but I had totally forgotten...If you feel two weeks notice is necessary and appropriate, I would try to continue for that time.